Some fish are meat-eaters, some are fully vegetarian, while others eat a variety of food. Almost all fish will benefit from some vegetable matter in their diet. So even if you don't eat your veggies, don't skimp on vegetables in your fishes' diet. Pacus, Silver Dollars, Farowellas, and Mollies are primarily vegetarian. Catfish are not fully vegetarian, but require a great deal of vegetable matter in their diet. Many other fish, from the Goldfish to Guppies, enjoy having vegetables as part of their diets. With the exception of a few carnivores, such as Piranhas, most fish will accept and enjoy vegetables as part of their diet. All foods should be washed well before serving. Leafy foods should be secured to the side of the tank. Pet shops offer vegetable clips for that purpose. If you have a magnetic algae cleaner, it will work just as well as a vegetable clip. For bottom- dwelling fish, use a rock to hold the greens in place. Promptly remove any uneaten food, as it will rot and foul the tank if left. It's not necessary to feed fresh vegetables every day. 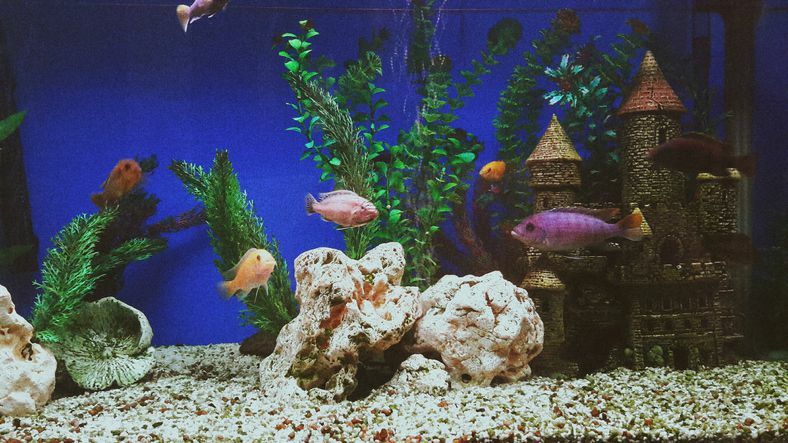 Vegetable flakes and pellets are a good option and should be used as part of a well-balanced diet for most fish. Algae wafers are an excellent way to provide vegetable matter to bottom-dwelling fish, such as plecos. Vegetarian fish often enjoy fresh fruits. Pieces of banana, peeled grapes, and melon chunks can also be periodically offered. Use small pieces, and remove uneaten portions within the hour, so they do not foul the tank.